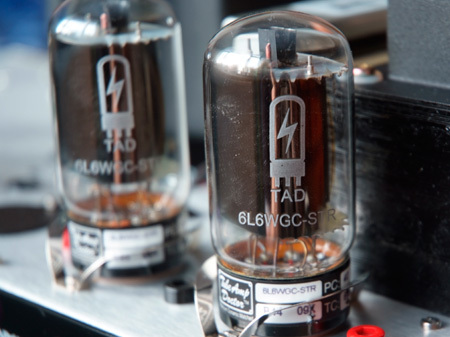 Dumble is a most respected tube amp maker in the world. 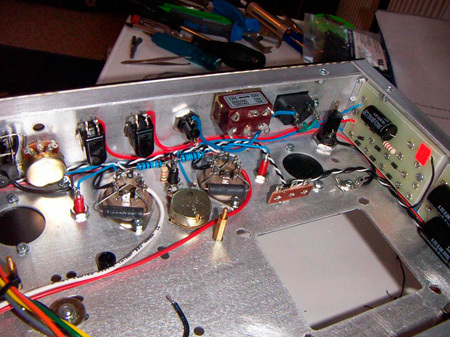 He developed an amp from Fender type amps. At over $50,000 for originals they cost more than most can afford. Step in Ceriatone. The Ceriatone Overtone HRM 50 watt amp was an amp kit I bought direct from Ceriatone - as much to see how hard it was to build an amp of this calibre as anything else. I was very surprised at the results. And even more surprised when I eventually plugged in and played this amp for the first time. The truth is, this was, before I started to build this amp, a mammoth task. 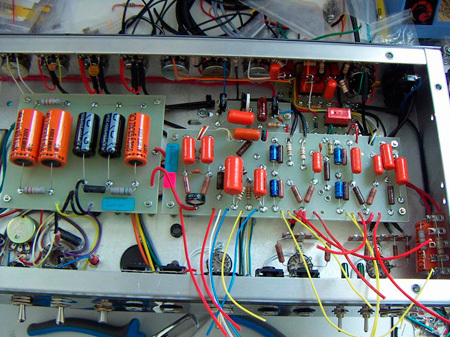 Ask yourself this - could you build a highly technical amp like this from scratch? Well the answer is actually you could - although you don't know it yet. It does take the ability to solder a joint (no not that type stupid) - and some basic electronics skills but I can tell you, given luck and a tail wind you could do it - and end up with a superb amp in to the bargain. It's no secret that this design is based on a design from a guy called Alexander Dumble indeed a copy or clone of his design in my view. Never heard of him? I'm not surprised. He would charge a very high price to make you an amplifier but with some caveat's. Firstly, if he did not like your music you could push off. 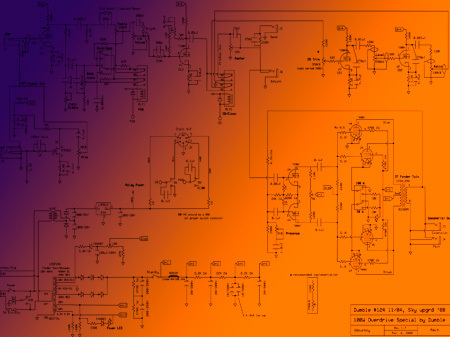 Then there was the matter of months or even years waiting for your amp. Then there was the little matter of money. Dumble amps were quite rightly expensive - he was one of the best amp techs around and he commanded the money for his work and got it. HOW things have changed. Mr. Dumble now sells guns (or he did at last head count) so you can't buy the darn thing anymore. What's worse - well the ones he did make fetch approximately $50,000 if you can find one - and then it may well not be suitable for your style. So along came a number of amp makers and 'cloned' one so you could buy theirs - seems like a reasonable deal. The advantage is, that the Dumble design (or something close to it) is now available built for probably no more than £1000.00 pounds. But if you buy the kit, it's cheaper - mine cost £600.00 pounds shipped. 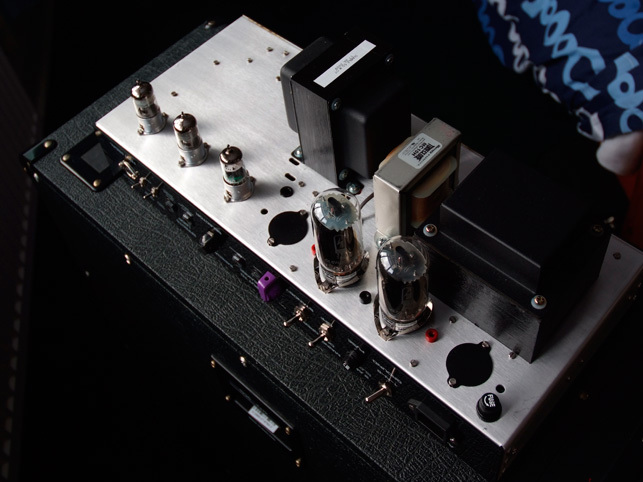 I built this amp in about three weeks and everything was included except the tubes - because I already had some. My amp came from Ceriatone - a good quality amp maker. This amp sounds awesome. It is built around (so legend has it) a modified Fender design that Mr. Dumble borrowed, applied his magic and there it is - a legendary sound. Clean this thing is very bell like especially with a Stratocaster (it should be) and with the other stuff kicked in this Overtone HRM version is like a Marshall on steroids. But seriously, if you have heard Larry Carlton then you've heard a Dumble. I think the HRM is better than his. The amp has most features that you would expect and a few that you would not expect - but checkout all that from the link at the bottom of the page - I don't want to repeat what anyone can find out and has already been done. I has a couple of silly things go wrong on the build (both my fault) and as I built the amp I made a video of the whole thing which is now available on my Overtone HRM website below. If you want to see how easy it is go there - you can watch the video for free. If you want to buy the video proper - you can buy it there also. 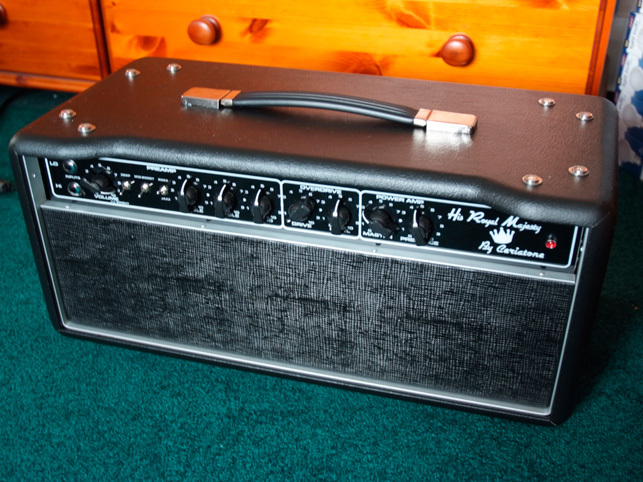 It's worth watching how I fared with that amp - you too might be very surprised. I value this amp toward £1500.00 pounds if you went to buy a custom job like this one is - so it's a great bargain and a great amp. I rate it at 9 out of 10 because you need a little knowledge to build it. This is a great sounding amp at a great price and I wholly recommend you go and check these out - you won't be disappointed. Don't forget to checkout my site - it's worth the effort. I wrote a complete site which has video on how to build this from scratch, check it out here: www.overtonehrm.com but I don't go there often so don't expect a fast response if you ask anything from that site. Below are a few images of the amp under review.